Just in from spy photographers in the coldest areas of Sweden are shots of one very interesting looking black A6-based Avant. With more aggressive front fascia (spotted on some earlier test mules) a wider track and add-on fender flares, there's no doubting that this is a preproduction prototype of the RS 6 Avant. Big ceramic brakes underneath A8 wheels only seem to further confirm the car's RS status. It is expected that the RS 6 will use the same 4.0 TFSI biturbo V8 as the S6, S8 and even the new Bentley Continental GT V8. Power levels remain to be seen, but iterations of the 4.0 TFSI in the S8 and the Bentley are 500+. Paired with a wider track and more aggressive brakes should make for an impressive configuration indeed. On the outside, while the chin you see here may be close to production, other changes will remain. The lower intakes may or may not change shape just a bit and most certainly the add-on flares will give way to integrated fender flares and possibly box flares like those of the C6 RS 6 that harkened back to the Ur quattro. We also wouldn't be surprised to see more ultra in the next RS 6 and see the car drop further weight through use of lightweight Carbon Fiber Reinforced Plastic (CFRP) on elements like the front fenders as we've already seen on the RS 3.
è molto A4!!!!!!!!! ma mi piace moooooolto!!!!!!!!! 4.0 V8 TFSI da 500 e passa cavalli, carboceramici e molte parti in carbonio..
Pero' questa RS 6 è bella forte , bella davvero !!! Come mai hanno abbandonato i due scarichi ovali?? Le quattro uscite fanno molto S e poco RS! Per il resto stupenda!!! Pare che vada di moda per le versioni RS in test star fuori col para anteriore RS e il post S..
ormai fan così su tutte.. mah! 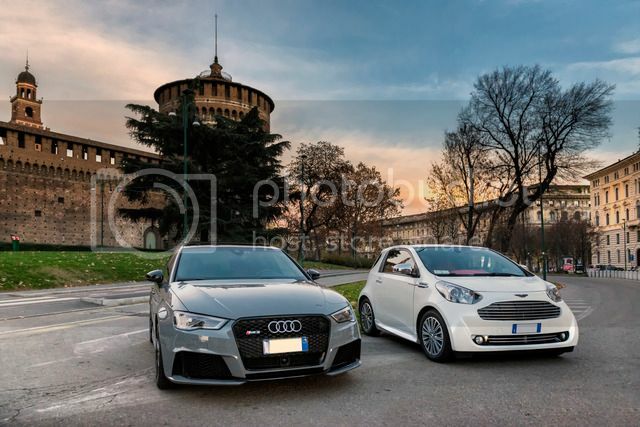 Io però voglio vedere anche la RS4.. Non sarà facile segliere: CV in più (RS6) o peso in meno (RS4)?! ?